Shipping: Price includes shipping for US/Canada/UK/Australia&NZ/Western Europe. Contact for any other regions. 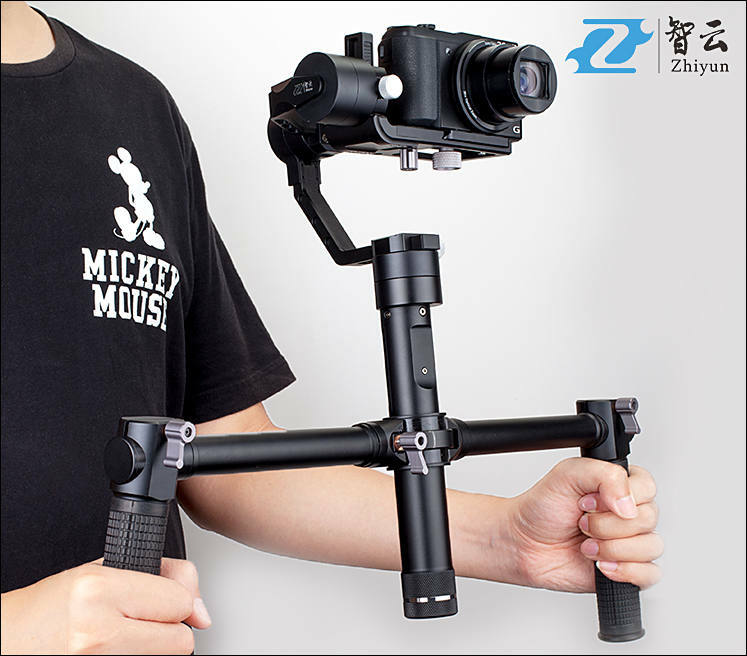 I want to buy this gimbal. I just got this in the mail. First Gimbal I have used, so not a lot of experience to make a comparison with. Here are some test shots i've done. 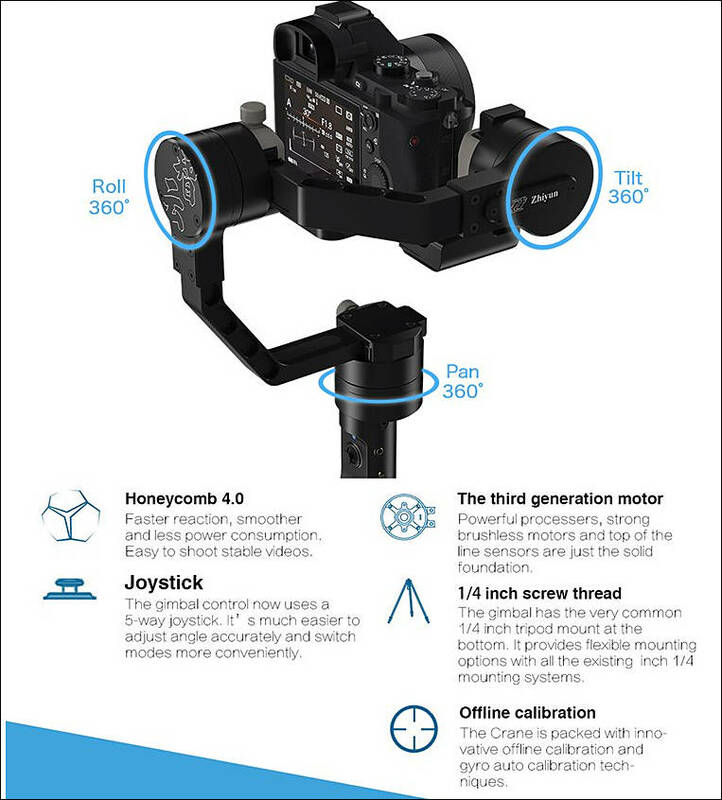 Zhiyun Z1 Crane available on deals, see first post. I just got a reply from Zhiyun's FB customer service. 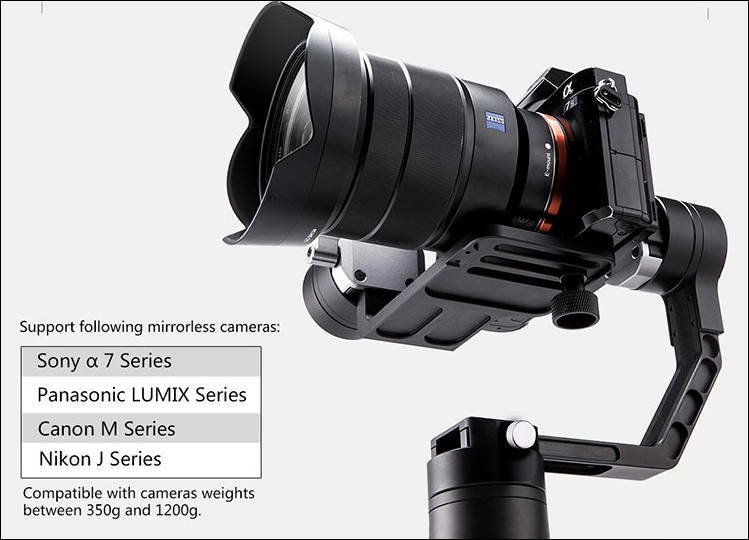 Looks like the Crane-M doesn't take the weight of the GH4. Too bad, it looked really good. "Hi, you mean the Crane-M? 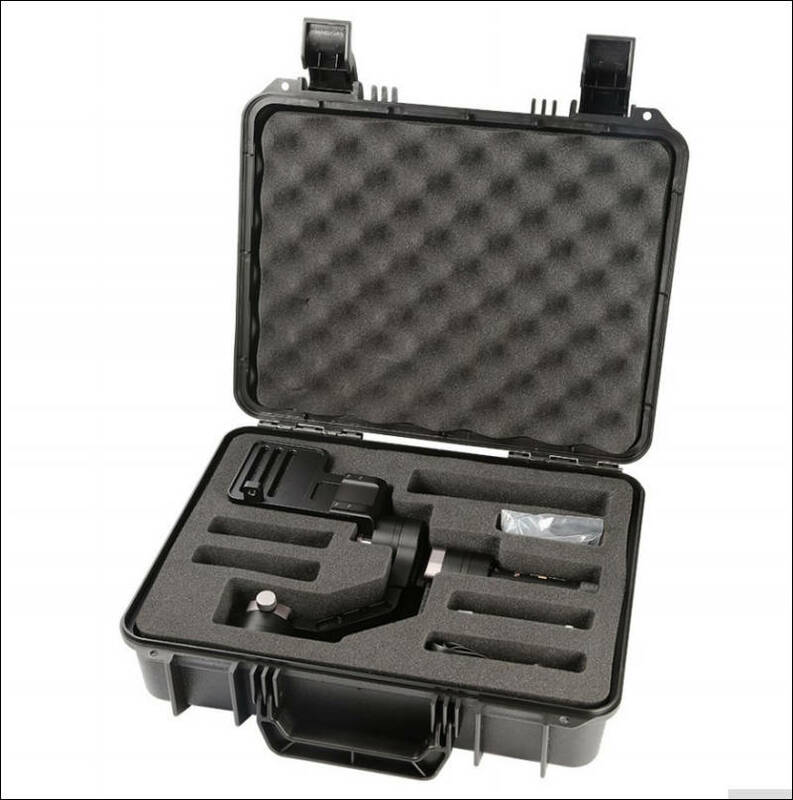 The max payload of the Crane-M is 650g Think the Crane-M will be not suitable for the gh4"
Crane M is different gimbal completely. It's looks like better than Nebula 4200 am I right ? I mean Nebula 4200 lite. Nebula is based on SimpleBGC controller (more tuning abilities), Crane on custom one (simpler, but more limited). Plus Nebula handles are plastic (this means warm) and more ergonomic. Just received my Crane Z1 from the Personal-View deal. Very fast, BTW, they used DHL Express to Germany. After charging the batteries I just went for a quick adjust with my Sony A7R II and a Zeiss C/Y 25mm on it. With all my prior experience it was a breeze to balance, about 3-5 minutes. The only problem I can see here that with a perfect position on the roll axis I can't open the SD card door any more. Yes, I can move the camera one more slot to the side, but then it get's at the edge of the horizontal adjustment, which might become a problem with other lenses' weight. Apart from this, it just works! What might be better to be said about a tool? It auto-adjusts in a short moment and hangs in space without any troubles. No vibration, not even noise. Perfectly positioned if I compare it to the HUD in the camera. Judging from the monitor values in my iPhone it's zeroed below the measuring tolerances in the Sony itself. Control from the phone is smooth and intuitive. Briefcase mode? Just turn it around, no switching or re-adjustment, just do it. 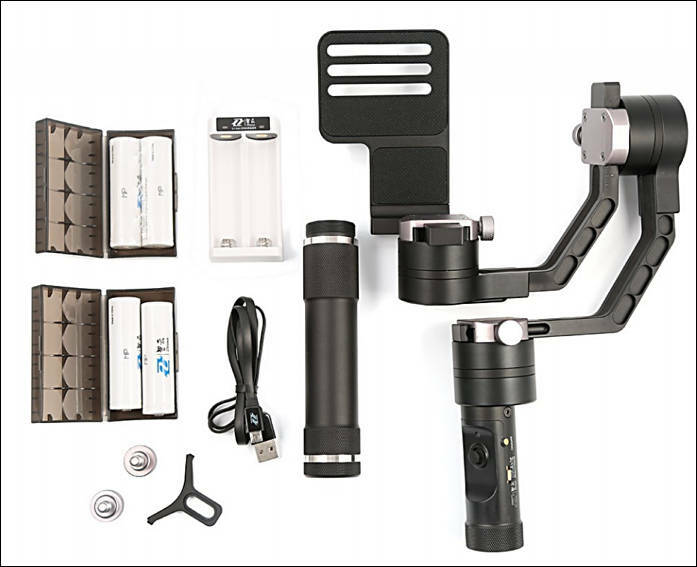 I'll try a few more camera/lens combinations, do some real world use and report, but for now I think I found my perfect gimbal for a very decent price. Does anyone know if this can function as a time-lapse head via bluetooth control for slow pan / tilt moves? It has separate Bluetooth remote (as option). So if you so badly want it and have someone with DIY skills you can just disassembly remote and modify it (using arduino or such) to make joystick signals supplied by separate controller. @Vitaliy_Kiselev Oh, I was hoping it might be possible to do it through the phone app. I am not big fan of phones as something that give turn signals for timelapses. It is too complex device where too much can go wrong. Ideally all phone must do is set internal parameters and firmware must work by itself. If you insist on using a phone, you may need to get the commands they use from the manufacturer and find someone to program an app. It is not supported by the app coming from Zhiyun. @Tron I sent a FB message to Zhiyun asking if they could add some motion control functionality to the app. This was the response: "For the app, at the next version we can add the time-lapse/motion control functionality into it"
I have no idea if thats an intention to do it or just a possibility. Personally I think they'd be daft not to add it. I imagine the simplest way to implement it would be to able to record beginning and end positions of the camera (almost like key-framing) and then just specify how long you want the gimbal to take to move between the positions. Well, in Asia it's not considered polite to say "no" to a client. OTOH, their app is pretty well done when compared to the one for the Pilotfly of last year (Android only, BTW) and it shouldn't be rocket science to add that functionality.